F.Y.E. Now Stocking 1:18 Supernatural! Indianapolis, IN (July 2014) – We're happy to announce that, as of right now, F.Y.E. 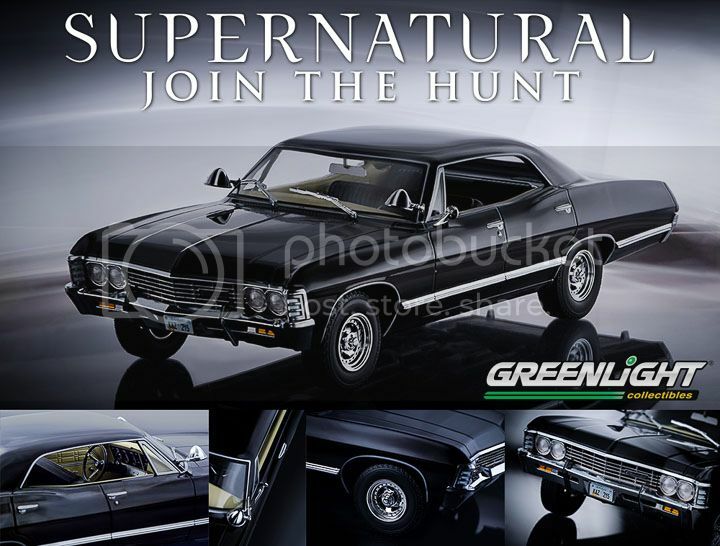 stores nation-wide will be carrying the 1:18 Supernatural 1967 Impala Sport Sedan! For those of you who didn't get a chance to swipe-up some Supernatural die-cast, check out a store near you! GreenLight Collectibles is a premier manufacturer and marketer of authentic die-cast vehicle replicas and other automotive-related products. GreenLight replicas are produced under various themes in 1:18, 1:24, 1:43 and 1:64 scales and are officially licensed by the world’s premier automotive and entertainment companies, including General Motors, Ford Motor Company, Chrysler Group LLC, NYC & Co., Warner Bros., Carroll Shelby Licensing, Universal Studios, Sony Pictures, MGM, IndyCar Series, NASCAR and many others.